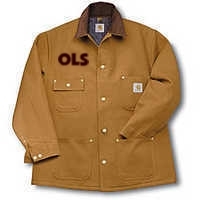 I have been looking for a heavier ranch style chore coat. The Carhart style we had previously used in is now discontinued. They will have the OLS letter on the front right shoulder and the New Tubs Logo big and bold across the back. We split the cost to our dealer/distributors 50%. They useally cost around $50-$75.00 total with all the embroidery charges. If you want your name put on the front there is a small fee. 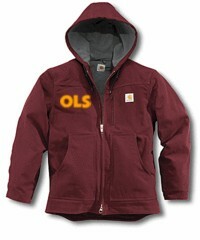 These Hooded Chore jackets are thinsulate lined and zip up the front. There may be tall and X-large sizes available for a bit more, usually $10.00. 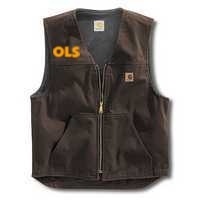 We buy these in bulk and have them embroidered with the OLS letter on the front right chest and the New Tubs logo big and bold across the back. The cost share is 50% or approximately $40-$60.00 each. If you would like your name on the front left chest we can do it for a fee per letter. We try to find a Carhart Style midweight winter lined Vest that fits appropriately and looks good. The ones we had last time were build for small wide people. I will try to find a source that has both X-large cuts and Tall cuts available. These may be embroidered with your name and the OLS letter on the front and the Logo on the back, big and bold. The approximate cost is $30.00-$50.00 cost share.